Attract customers and increase sales with custom stone business signs. Statistics show that as many as 46% of first-time customers learn about your company when they see your business sign. A stone business sign will make your business stand out and reinforce your brand image. Choose from one of the hundreds of stone pieces we have in stock, either by visiting one of our showrooms or browsing our website. Then, you can send us your photos or drawings of what you would like on your stone business sign. Once the design has been received, Always in Stone will engrave your stone business sign. We deliver and install custom stone business signs for companies in our service area. The city of Elkhart requires that all businesses signs meet certain guidelines as set forth in the Town Ordinances. All on-premise signs, except wall, marquee, and awning signs, shall be located no closer than five (5) feet from any right-of-way. Signs shall be erected so as not to obstruct sight lines along any right-of-way or so as to obstruct sight lines to traffic control lights, street name signs at intersections, or signals at railroad grade crossings. For more information, contact Always in Stone or The City of Elkhart. 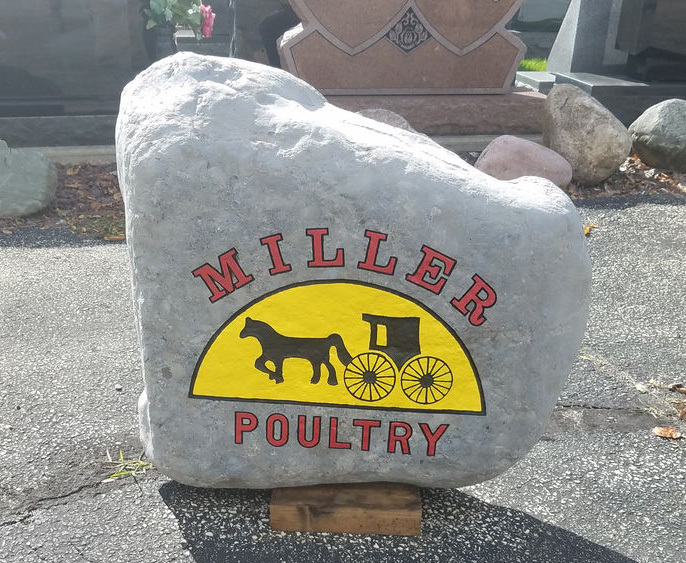 We provide delivery of your stone business sign to any business located in Elkhart County or within 50 miles of our showroom.